47 Year Old rising star Susan Boyle had her singing debut on "Britain's Got Talent" last weekend. The panel of three judges, including Simon Cowell were visibly shocked when she began to sing; she gave a stunning performance, and the audience rose to its feet as she sang through "I Dreamed a Dream" from "Les Miserables". To date the video clip of her performance on YouTube has been viewed by over 12 million people with the number still rising. Broadcasters from around the world are queuing up for interviews. "Without a doubt that was the biggest surprise I have had in three years of this show," said judge Piers Morgan, admitting that before her performance "everyone was laughing at you." "No-one is laughing now. That was stunning." Susan Boyle's success has drawn comparisions with Paul Potts, an opera singing mobile phone salesman who won in 2007. Want to practice your singing and see how good you really are? 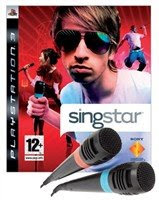 Check out 24Studio's fantastic range of Singstar products.